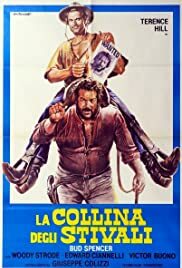 My order of almost all Bud Spencer & Terrence Hill movies. In Africa, 2 expat "brothers" are usually at each other's throats but now have a common enemy. Ormond's men are shooting or catching much of the wildlife for export as well as forcing the locals off their land. Lots of fun fights follow. Mami: And now ladies and gentleman our most publicized attraction: The Flying Men. Q: What are the differences between the Export Version and the Integral Version? Q: What are the differences between the International Version and the Long Version? Muddled and badly shot Western.